4×4 Tyres are one of the most important parts that make up your car. It won’t matter how light or powerful your car is, without proper tyres to put that power to the ground you aren’t going anywhere! Traction is created by tyres, and fitting the right sort of 4×4 Tyres to your car will make all of the difference. It’s often been said that if there is one thing that you can change on your four wheel drive, do the tyres as they make the most difference. 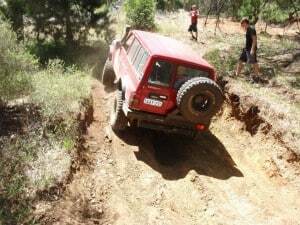 Differential locks and suspension lifts might make your vehicle look better and flex well, but they won’t make it go further if you lose traction (which happens a lot when you start doing more serious 4×4!). I will be blunt when it comes to getting the right set of tyres. 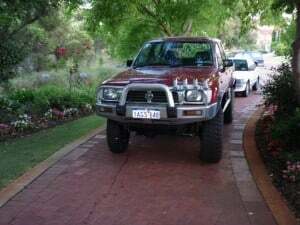 Unless you have more than one set of tyres, you are never going to get the perfect set for 99% of 4wd Vehicles. The reasoning behind this is quite simple; tyres that perform the best on road don’t perform as well off road, and vice versa. What this means is that your 4×4 Tyres need to be a compromise between the two. You might have often seen tyre companies advertising 4×4 Tyres that are for 20% off road and 80 % on road, or slightly different. This is a good help when you are choosing the right tyres, but be aware that unless you have two sets (one for driving around town and one for taking four wheel driving) you will have to compromise in one way or another. By this I mean that if you are doing serious four wheel driving you can fit a set of Mud Terrain Tyres on, but they handle worse and are much noisier than a set of Road Terrain Tyres. There are a number of different tyres, which I will go into below. These range from tyres specifically designed for driving on the road, then those which are designed for half on road and half off road, and then the fully blown four wheel driving tyres. Of course, for competitions they have gone even further and created the most aggressive tyres on the market, to get the most amount of traction. Rims to suit these also range a lot, so make sure you take the time to research your rim and tyre combination before you spend a few grand! 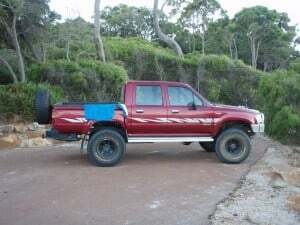 I will quickly mention tyres for boat trailers, caravans, normal trailers or a Camper Trailer .If you plan on taking it off road, its worth paying the extra money to get a Light Truck version; they will take more load and handle the terrain better. When you buy a new car from a car yard, the tyres that they come with are usually the cheapest option. This makes sense, but it means if you want to do any serious four wheel driving you need to consider changing them. Unless you ask for something different, these are known as Road Terrain Tyres, and they are very plain. 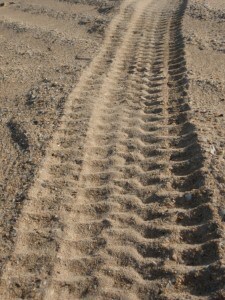 They can be identified by the small grooves running lengthways along the tyres. They don’t look very aggressive or chunky either, which is why they are so good on the road. These tyres are the best option for running on road, and they are ok to use on the beach and for basic four wheel driving too. However, the moment you meet mud or any serious rock work these simply won’t cut it, as the traction just isn’t there. These are often much cheaper, but it’s not always the case. All Terrain Tyres that weren’t deflated enough! In terms of putting new tyres on a four wheel drive that gets driven on road, these are about as far as you can go. They are obvious with massive chunks of square shaped rubber on the tyres, a huge amount of tread and side biters too. Side biters are basically bits of rubber that stick out on the side of the tyre to provide the extra traction on the side of wheel ruts. These are very helpful in mud too, and will often make the difference between you getting through or not! Mud Terrain Tyres are built primarily for use off road. A lot of people put them on cars that still get driven on road, but you will find that they perform worse on road (except in the wet!) and they are much noisier than both an All Terrain Tyre and a Road Terrain Tyre. I run Mud Terrain Tyres on My Hilux, and they are fantastic. I can easily put up with the extra bit of noise (and the tyres get louder as they get older too!) because of the huge difference they make off road. In the mud, they chew their way through, on the rocks I have plenty of added traction and on the beach they work well too. These usually cost more than All Terrain Tyres and Road Terrain Tyres, but again it comes down to the brand that you purchase the tyres off in the first place! I am a massive fan of the Maxxis Bighorn. They are incredibly cheap, brilliant on the rocks and in mud, and good on the beach. You can get these all over the place, and they are one of the cheapest Mud Terrain Tyre. They will usually last in between 60 000 kilometres and 130 000 kilometres (depending on how much four wheel driving you do and how you treat and rotate them). 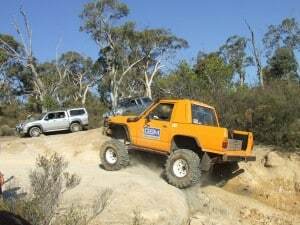 The most aggressive of all the tyres are known as competition 4×4 Tyres. These are built differently to Mud Terrain Tyres and are not suitable for high speeds. As a result, you are not legally allowed to drive them on the road. These are similar to the Mud Terrain Tyres, just more aggressive with larger blocks of tread, larger side biters and often more sidewall flexibility for that extra traction. 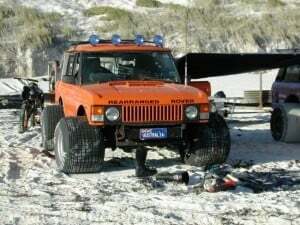 Beach Driving and types of 4×4 tyres can be very controversial. Many people swear that your standard Road Terrain Tyres are best when it comes to driving on the beach, whilst others say that their Mud or All Terrain Tyres do much better. When you drive on the beach the aim is to sit on top of the sand, rather than digging down into it. When you start digging you sink and risk getting stuck! More aggressive tyres tend to dig a little bit, but they are almost like sand paddles and keep going. At the end of the day for beach driving any of the tyres work, but you need to deflate them enough. This is the main reason why a lot of people get stuck when it comes to Beach Driving. One of the first 4×4 Accessories that you should purchase is Tire Deflators; they are regularly used and play a very important role! 2 very different tyres on my car! Like every two wheel drive car on the market, there are a lot of different sizes that you can get for your 4wd Tyres. These are either measured in inches or the metric version. Something to pay particular attention to is the legalities of putting different tyres on your car. Larger tyres might look good and give you the added clearance, but are they legal? Larger tyres are harder to turn, harder to stop and they adjust your gearing so that your speedometer is incorrect and more stress is put on your clutch and drive train. Before fitting larger tyres you want to find out if you can! If you can’t, can you get an engineer’s certificate to say that it’s all ok? Again, check with the engineer before you put them on as tyres and rims are expensive to be replacing! Most places in the world will allow you to put slightly wider tyres on as a start, which can be a good help when off road, but will stress your steering more too. Generally tyres that are a few inches taller and wider will do every car just fine, but find out if you are allowed to do this. The lowest point on your vehicle is always governed by tyres. A body lift will lift the body up a bit more, and a suspension lift will move the chassis up more, but the lowest point is always going to be your differential pumpkins. To lift the differential pumpkins up, you need bigger tyres! Pay particular attention to the sidewall size of your tyres. The sidewall is the rubber between the rim and the top (or bottom) of your tyre. The larger the sidewall on the tyre, the worse the car will perform on road (as the tyres can flex from side to side when cornering). At the same time, they will be better off road, as when you let the tyres down they will bulge out more, creating a larger surface area. This in turn means more traction, which you can never have enough of! Of course, you should go a sidewall size that fits your car and what you want to do with it. There are just as many options when it comes to 4×4 rims as there are for 4×4 Tyres! However, they are all made of either aluminium or steel, which is a good start. Picking the right set of rims for your vehicle is important because they keep your tyres in shape, and affect your handling a huge amount. Both of these rims have their advantages, but I would always go for a set of Steel Rims. Aluminium Rims are lighter and much better looking, but at the same time they cost several times more than steel rims and they are not as strong either. Steel rims are heavier, much stronger but usually not as good looking. When it comes down to any work that is remote, Steel Rims are your best bet. They are easier to repair or replace, and when you are stuck miles from anywhere you want something that is going to last! The Rims that you purchase all have a specific Offset. What this means is that the centre piece of the rim is moved one way or the other, to suit the brakes and extra stance of your car, if you want it. Negatively offset rims stick out from the body more (and help stop the vehicle becoming unstable) whilst positively offset rims sit closer to your differential. Be aware of the offset of your vehicle as too far one or the other way is most likely not to fit. It can easily rub on the brakes or not be strong enough. For serious four wheel driving, getting a rim that is maximum negatively offset is the best option but consult the law before you throw them on! This is a section that very few people actually understand and make full use of. 4×4 Tyres should be adjusted according to the terrain that you are on, the speed you are travelling and the load that you have in your car. When driving on road, don’t leave your tyres at what the tyre place tells you to (as most often they are not correct). The correct pressure for your vehicle will cause the tyres to wear evenly. Too high pressures and you will wear the middle out of the tyres faster than the outsides and too low and you will wear the outsides of the tyres. If you want the correct way to keep your tyres running well, search for the ‘4 PSI tyre rule’ on Google and have a read. As you drive along the tyres will heat up, and this is dependent on the load in your car, size of the tyres and various other bits and pieces. When it comes to running the right pressure for four wheel driving, there are some basic guidelines (but these vary from car to car). For example, a vehicle that weighs a huge amount will have to keep their tyres up much higher than a vehicle that weighs very little. A Patrol at 15 PSI has the same sort of footprint as My Hilux at 10 PSI, because of the huge weight difference. When you go four wheel driving, letting your tyres down is the most important thing that you can do. The reason you let your tyres down is that the tyres bulge out and create a bigger surface area. 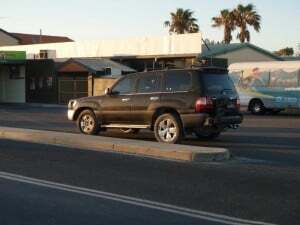 The more surface area, the more the car can grip onto things, or sit on top of (in the case of beaches and sand dunes). 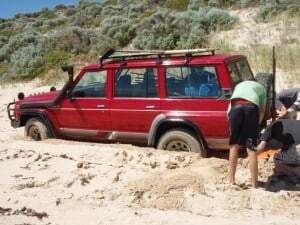 People who leave their tyres at 40 PSI will usually get stuck on the beach because they sink straight away. Be aware that beaches vary a lot. Some of them you can comfortably cruise on at 100 km/h in a two wheel drive car, because they are rock hard. Others may be incredibly soft and you might even have to go right down to 8 PSI to get through it. As a general rule I go to 15 PSI and if I am struggling I will go down even more. Soft Sand Dunes will have you struggling even more, and sometimes you will have to drop your tyres right down. For gravel roads, you should drive with four wheel drive high engaged, and have your tyres in between 23 and 26 PSI. For Mud and Rock work, tyres should be in between 15 and 22 PSI and for Beach work your tyres should be in between 12 PSI and 18 PSI. Don’t be afraid of letting your tyres down quite a bit, but know that the more they are deflated the easier it is for them to come off the rim if you are turning at high speeds. Adjust the tyres according to the terrain, so that you limit most of the wheel spin. As you will very quickly find out, the right tyre pressures to match the terrain will make 100% difference to how your vehicle goes. Having lower pressures also takes stress off the driveline and engine. This is another subject which people’s opinions vary vastly on. Some people say that you should never swap sides on your tyres, whilst others say you shouldn’t use your spare and others say differently again! Personally I think if you aren’t using your spare you are wasting money as the rubber goes hard over the course of a few years anyway and the tyre becomes unusable. I rotate all of my tyres in the following way. Front right goes to right back. Right back goes to the spare, and the spare goes to the front left. The front left goes to the back left and the back left goes to the front right. After 5 rotations you have the tyres back in the same position, and this works well for me. Have a good read of what others do, and why they do it and then make an educated decision on what you are going to do. Above all, make sure that your wheels are balanced at all times, and that the wheel alignment is done at least every 10 000 kilometres. 4×4 Tyres will make a massive difference to the way your car handles and the places you can get to, which is why it’s so important to know and understand more about them. Take the time to do some research into what you are allowed, what you want your car to do and where you drive it most, and then get a set of 4×4 Tyres and rims which suit you best! A competition GQ with a bent rim! Hi & thanks for all the info on your website, I’ve been enjoying it. A little correction for you: Lowering the pressure in your tyres is indeed very important as you mention however it is not the ‘bulging’ that provides the better traction on soft or shifting surfaces. Yes, the tyres will budge but its the increase in the ‘track’ or length of the footprint that will provide the bulk of extra traction. Even skinny tyres can do very well if the pressures are reduced. 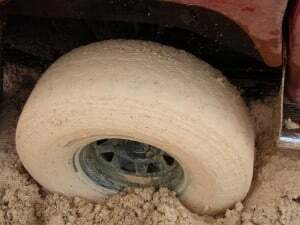 On rocks, the pressure reduction helps to ease the surface tension and allow the tyre to form itself over the rocks etc. Much like a pin wont damage a soft balloon, the softer tyre protects itself. On rocks and around staking dangers like Mulga roots, bulging is actually a bad thing as the sidewalls are more exposed to damage. Like most things we usually have to compromise as we need to spread that footprint length when we need to and too stiff a sidewall will reduce this but as rule I would say tougher sidewalls (and therefore less bulging) are a better consideration. You are completely correct, and I’ve actually mentioned this in a number of posts since. The article you’ve commented on is 8 years old; my appologies if it does not make the concept very clear!